With thanks to Hodder & Stoughton for the copy of this novel! As always, my reviews are non-bias and fair. As the countdown to college begins, life at home becomes increasingly complex. With family relationships and childhood friendships strained by change, it suddenly seems that the only people Elizabeth and Lauren can rely on are the complicated new boys in their lives . . . and each other. Even though they've never met. It was apparent even just a few chapters into Roomies that it was in a league of it's own. With it's witty humour, realistic glimpses into the changing lives of teenagers on the verge of a life-altering move away to college and breaking old ties to those they were leaving behind. Elizabeth and Lauren are both in the Summer before leaving for College; UC Berkley. When Elizabeth gets Lauren's contact information from the College to introduce herself and organise things like TV's and Microwaves, Lauren is far from welcoming. She requested a single room, and after the request was denied, her disappointment comes across in the short and unwelcoming email to Elizabeth. Elizabeth is an only child, so she was really excited to get a room-mate, but Lauren has five younger siblings so she was looking forward to getting her own space without any complications whatsoever. So it's noticeable straight away that these girls are nothing alike and have completely different outlooks on life and friends and family. But, after getting off on the wrong foot, they seem to steadily get on track and start to peer into each other's lives over the course of the few weeks through emails. I enjoyed reading Roomies far beyond belief. I thought that I could honestly relate to so many things in Elizabeth and Lauren's POV's. Whereas Elizabeth had a group of friends and a boyfriend; who I didn't like, at the start of the novel, Lauren had a more simple group of friends and a big family instead. But as Elizabeth grows in herself and more toward a more independent person, she drifts away from her friends and towards her love interest from a few chapters in; Mark. I much more preferred her with him, but still as College grew nearer, she would be leaving someone who she had just begun to know, behind. Lauren had a very hectic life with five younger siblings, who she looks after quite a lot. So at the start of the book, she's still trying to organise her life and craft it into something that she can carry with her, but struggles with the people she would have to leave behind--like who would look after her siblings? Who would help around the house? These things effect her, though someone who brings out a different side to Lauren is Keyon, a boy she works with. They have a good friendship, not so much when they were in school, but since they've been working together. I totally rooted for them the most in the book, because there wasn't that "insta-love" that I hate, it was a very sweet and believable thing. I usually wouldn't pick favourites, and it was a very close competition, but I did slightly prefer reading Lauren's story. Elizabeth's story was very thought-provoking and enthralling, but Lauren's just felt a little more real and honest. But that's just me, obviously. Everyone will have their own favourites or characters they felt more connected with. Keyon and Mark were both two of my favourite characters along with the girls in the novel, and maybe beyond that as well. They seemed to honestly care very deeply for Lauren and Elizabeth, and the ending was so heart-warming and sincere, but sad at the same time. Even though I knew all long that they would leave, it was hard to see their stories end. This was one of my favourite books of the year, hands down. I did a post not too long ago about my favourite new-to-me authors of the year, and even though I have read Sweethearts by Sara Zarr, I hadn't read anything by Tara Altebrando yet, so this would've put them on that list firmly. If you're looking for something to read before you go on an adventure, or are in the same position as Elizabeth and Lauren, moving away, then this will be a winner with you. Or if you're an older YA reader, or just love a good Young Adult/New Adult novel, you will treasure this one. I very rarely want to re-read a book, because I'm always eager to move on to another, but something compels me to want to dive back into Roomies. 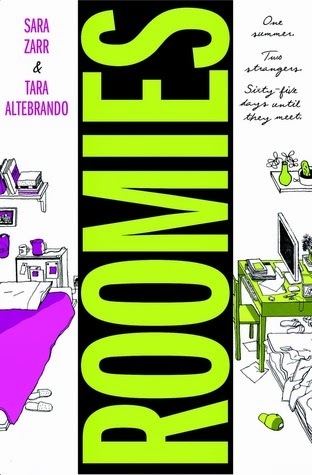 Unique, thought-provoking and honest, Roomies is a five-star coming-of-age novel that I recommended HIGHLY. And it's out in two days time; the 24th of December! The perfect Christmas gift! This was one of my favorites of the year, too! It was such a great book! I know, right? It was so incredible!